This system integrates the DT-810 with an 8 position flow-cell accessory and a UV-Vis spectrophotometer. A peristalic pump (LH-PV2) continuously circulates sample solution between the 8 dissolution vessels and the flow cell accessory. Absorbance values are measured at user declared intervals and dissolution rates are automatically calculated. External samples can also be introduced for analysis. This system integrates a fraction collector and the LH-PV3 pumping unit for off-line testing. As many as 12 sets of samples with a volume of 20 mL or less can be collected form each dissolution vessel at pre-set intervals. Additional flow lines for solvent refills or line flushes using internal or external volumes are available. 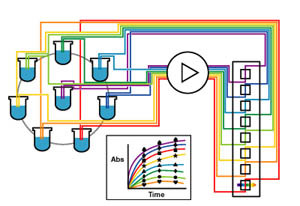 This system combines the fraction corrector and a flow cell installed in a UV-Vis spectrophotometer. Samples from the dissolution vessels are collected in test tubes using the fraction collector and sample aliquots are analyzed by the UV-Vis using the autosampling capability of the fraction collector. 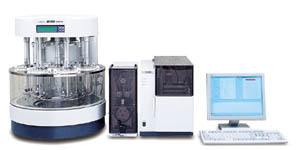 Residual sample volumes can be analyzed later using other techniques such as HPLC. 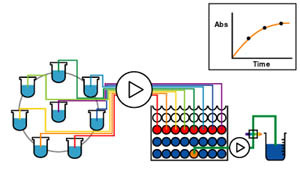 The analysis of dissolution samples by conventional spectrophotometers or conventional HPLC separations can require a large amount of time when analyzing the number of samples collected from a dissolution test. 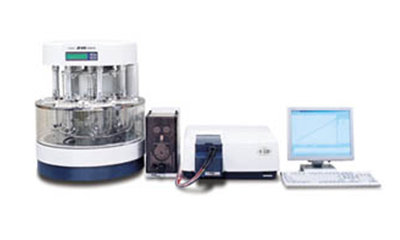 With the JASCO LC Dissolution rate calculation program and a vial rack which can be used for both of the DT-810 Dissolution Tester and the X-LC 3159AS auto-sampler, the combination of the DT-810 and the extreme high speed liquid chromatography (X-LC) systems provide a smooth measurement from the dissolution test to LC analysis. 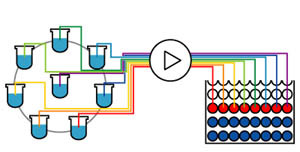 Using the X-LC, which is capable of reducing analysis time, 5 to 10 times less as compared to conventional HPLC, also makes it possible to offer a significant reduction of the total analysis time.